Free To Choose TV series. 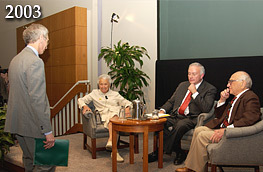 Bob Chitester speaks with Milton and Rose Friedman and Robert McTeer, Jr., former Dallas Federal Reserve Bank President, at the Bank’s symposium on the 25th anniversary of the PBS television series Free To Choose. A meeting of friends. 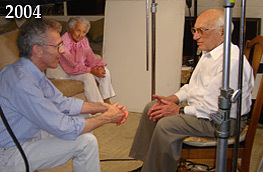 "The Power of Choice" Executive Producer, Bob Chitester, visits with Milton and Rose Friedman during production of the PBS documentary. Chitester was also Executive Producer of Milton Friedman's popular series Free To Choose in 1980. The Friedman's and Chitester have been friends for nearly three decades. Bob Chitester is president and CEO of Free To Choose Network, Inc., Chitester Creative Associates, Inc. and managing partner of Free To Choose Enterprise. These companies produce television programs for public television, educational videos, create and operate web sites, create CD-ROM and print materials as well as distribute curriculum materials to high schools and colleges. 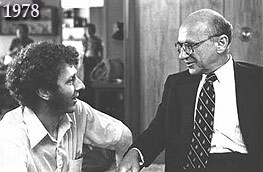 In 1977, Mr. Chitester convinced economist Milton Friedman to undertake a project which became Free To Choose, an award-winning PBS TV series and an international best-selling book based on the series. Over 30 years later, the series and book are still in wide use and have been profoundly influential. Mart Laar, first Prime Minister of a free Estonia used Free To Choose, as a guide in setting policies that resulted in Estonia’s thriving economy. Free To Choose Network, Inc. is a 501-c-3 public foundation doing business as izzit.org (formerly In the Classroom Media), Free To Choose Media and Free To Choose Press. Its corporate purpose is: To use accessible and entertaining media to build popular support for personal, economic, and political freedom thus advancing human well-being. Chitester created the Stossel in the Classroom educational effort, which served as a prototype for izzit.org. As of September 2012, izzit.org had created a nationwide network of over 300,000 teachers who are using one or more of our video teaching units or our daily current events service. Free To Choose Media recently completed production of Testing Milton Friedman, a three-part series debating whether Friedman’s ideas, as set forth in his 1980 PBS series and book, remain relevant today. Also being distributed to public TV stations is Europe’s Debt: America’s Crisis?, a one-hour program hosted by Johan Norberg and Donald Boudreaux. In production are three major works; an analysis of the Arab Spring hosted by Hernando de Soto, a one-hour introduction to The Fraser Institute’s Freedom Index; its methodology and value, and a one-hour TV biography of Walter Williams. In the mid-nineties, working with TCI in Denver, CO, Chitester Creative Associates, Inc. created Damn Right, a nightly half-hour program, whose alumni include: David Asman, Eric Burns and Douglas Kennedy, currently regulars on the Fox Cable News Channel, Jonathan Karl of ABC News, and Richard Lowry, editor of National Review. Another production, National School Assembly, with David Robinson, MVP center with the San Antonio Spurs, is currently being offered to teachers via izzit.org. Chitester also started The Idea Channel, a library of over 200 video recordings of intellectual discussions between the world's leading scholars. The collection currently includes 16 Nobel Prize recipients, including Friedrich von Hayek, James Buchanan, Christian de Duve, Norman Borlaug and Charles Townes, plus other notables including George P. Shultz and Walter Wriston. The Idea Channel library is now owned by Free To Choose Network, Inc.
As a partner with Janet Martel and David Friedman, Mr. Chitester manages Free To Choose Enterprise, which sells and licenses the use of the Free To Choose TV series. Mr. Chitester has more than fifty years of experience in television management and program development. He started educational television facilities at Buena Vista High School in Saginaw, Michigan and Edinboro State University in Pennsylvania. In 1966, he became the founding general manager of the Erie, Pennsylvania PBS and NPR stations (WQLN and WQLN-FM), which he headed until 1982. Mr. Chitester earned his B.A. and M.A. degrees from the University of Michigan, and received an honorary Doctor of Literature degree from Allegheny College. He and his wife, Carol Lovell, have four children and eight grandchildren.